It wasn't until the Mattel company came up with a simple pull-string talking mechanism that it incorporated in many OF THEIR toys, and then dolls in the early 1960s that talking dolls became widespread and relatively inexpensive. Dolls such as Chatty Cathy, Sister Small Talk, Mrs. Beasly and the Talking Barbie used this mechanism. Some talking dolls continue to use the pull-string technology today. However, technology has progressed ENORMOUSLY and so have talking dolls. Now, its not enough for a doll to talk--the current generation of doll manufacturers HAVE createD an interactive TALKING doll. 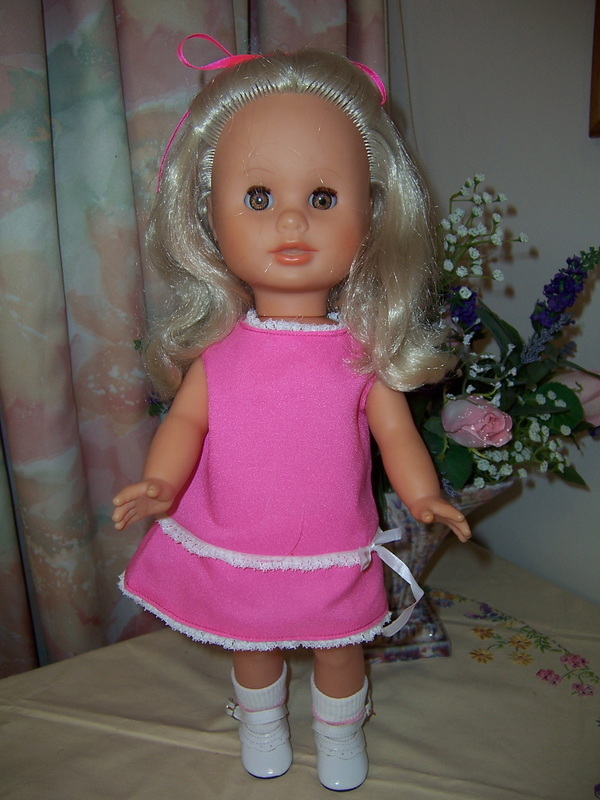 This doll is 17" (44cm) tall, and is a pull string talker and we do not know who actually made her. She works like a Chatty Cathy doll but we know she is not made by Mattel as they always branded their dolls..
She has a pull string in the back of her. She works very well and talks quite clearly. This doll is a rare Croner ''Baby Loves to Talk'' doll in original box with original instructions on how to work her. 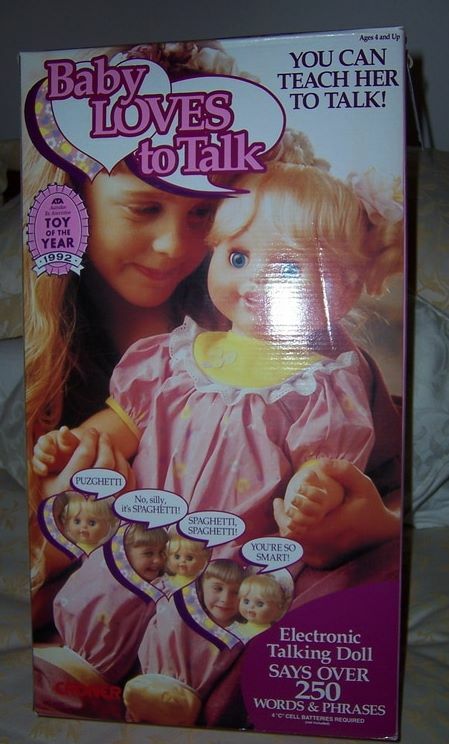 She is an ''electronic (battery operated) doll and says over 250 words and phrases and you can teach her to talk''. She is in her original little all in one cotton outfit, and still has her clear plastic covers on her head and pigtails. She looks like she has never been used as a toy but the previous owners left old batteries in her. We have cleaned up the terminals and have put alfoil on the connections and she works perfectly. She takes 4 ''C'' cell batteries which we will leave in her so she will work for you straight away. You have to teach her to talk and she has a set list of words that she will mispronounce and it is up to you to teach her the correct way to say the words. Once you have taught her the words she will speak to you in short sentences.
. open slightly pink smiley mouth. She is in wonderful working condition in original box with original cardboard inserts, and is just gorgeous.